The Indian-English artist Anish Kapoor is currently, and for the fourteenth time on show at the Lisson Gallery in London. Since 1982 the partnership between Kapoor and the Lisson Gallery keeps going and is once again marked by this untitled solo show. Returning to the practice of painting – but still keeping a 3D dimension thanks to the resin he uses – Kapoor continues to explores the red color. Mostly known for his sculptures playing with emptiness, volumes, mirroring and perception, Anish Kapoor now questions the plane surface of the walls with this exhibition. 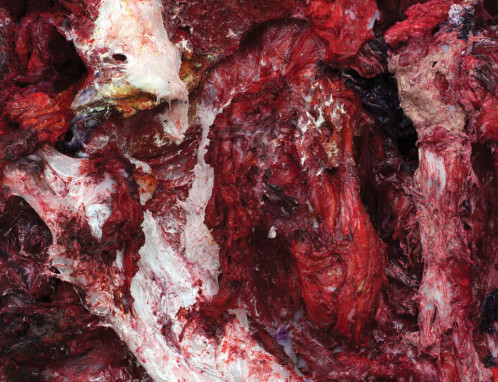 Mixing white and red paintings to resin, the final results make an optical illusion of raw flesh. These unusual Kapoor pieces are mixed with his mirror sculptures. 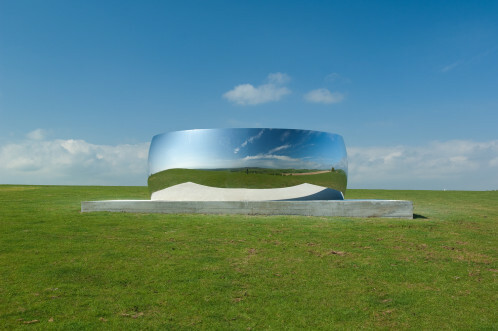 Made out of steel, their reflections invade and multiply the space, projecting another dimension around. This indoor exhibition introduces the soon to come Anish Kapoor show in Versailles. On the occasion of this summer event, the artist will invade the gardens of Louis XIV in order to print his minimalist yet decisive touch.